Madness is something that is hard to portray cinematically, because it happens internally. Many people may show outward signs of madness, but that isn’t always true. Someone that you may know as mad just might have motivations that you can’t quite understand. This leads to sane actors trying to overreact and act physically strange in order to convey madness. It almost never works completely. The viewer is almost always made aware that the person she or he is watching on-screen is a sane person copying the actions of an insane person. A Beautiful Mind, Fight Club, Girl Interrupted, and several other movies about insanity all seem to be heightened in ways that would be completely unbelievable if reproduced in the real world. But when John Cassavetes gets a hold of a subject matter, be it nightclub ownership, alcoholic artists, or madness, he brings earthiness to it that is unachievable elsewhere. He is able to ground such a maddening subject matter in reality. Mabel and Nick live together. They have three children. He works as a construction worker and seems to be always on the job. She is a housewife and never seems to be on the job. He brings home his buddies from work, but she doesn’t know quite how to act around them. She says inappropriate things and doesn’t pay attention to social cues. He berates her in public and gets frustrated with her actions. But when they are alone, they are in perfect harmony. She doesn’t seem to know who she is and what her life is supposed to be about. She loves her children fiercely and her husband even more. One night, after a long and drawn out fight, he calls their doctor to have her committed. But if she is crazy, isn’t he, even if it is just a little? After all he takes his kids out of school and to the beach for probably the most depressing beach scene ever committed celluloid. He also invites over a massive amount of people to welcome his wife home from the mental institution, only to dismiss them moments before she makes it there. However he has a way to vent his anger and frustration and craziness by being able to be on the job and around people. Being holed up in a house taking care of kids all day can drive anyone insane. 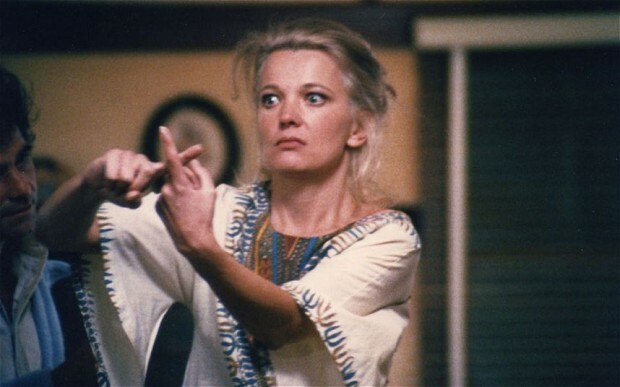 Through watching several Cassavetes movies, I have come to appreciate what a power house Gena Rowlands is. She plays Mabel with such an odd intensity that it is hard not to believe she is slightly crazy in real life. Her commanding performance lies in the details. She adopts a herky jerky movement and twirls her fingers around when she is diving into an episode. Her speech becomes erratic and nonsensical, obsessing about particular problems in her life-like not living up to her husband’s expectations. But certain gestures and speech patterns seemed to have existed before she dives into mental illness, making her husband doubt if she is really crazy or not. I’m guessing that Mabel has always been a little bit off her whole life, it just gets to the point that it is causing embarrassment for her husband. Peter Falk as Nick is a good foil to Gena Rowlands. Whereas Mabel seems to be sensitive and always looking to please people, Nick is brash, up front and quick to anger. His dominance didn’t seem like a conscious decision on his part, just a learned behavior after years in this relationship. Cassavetes treats both of these characters with the love and respect I have come to know him for. Although there are obvious doubts about Nick’s decisions and mental clarity, I can also understand where he is coming from. He wants his wife to be truly happy, not this weird manic type of happy. The cinematographer of the movie gives us a psychological sense of Mabel’s unwinding by showing her in extreme closeup and shaky camera movements. When Mabel is at her most erratic, it is hard to know exactly what is happening on the screen because the camera has to work overtime to keep up with her. It is almost as if the camera has become exhausted with her movements just as much as Nick does. This effect adds a potency to Gena Rowlands’ performance and gives you a subjective viewpoint I find fascinating. This is easily my favorite Cassavetes movie that I have watched so far. If you have yet to dive into the work of Cassavetes, I would suggest watching this movie first. This movie will give you a feel for the Cassavetes style without alienating you by the odd narrative paths he usually heads down on.